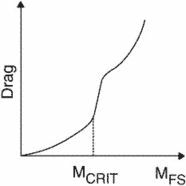 Note the increase in the drag once critical mach number (MCRIT) is reached. The x-axis represents free-stream Mach number (MFS). An increase in drag associated with the formation of shock waves over a body as it approaches the speed of sound.